Cloudy and Tangled Thoughts evokes the experience of lying on a blanket, gazing at the sky, watching patterns form and dissipate in the leaves, wind, and clouds. It consists of a blanket made from traditional and conductive textiles and a lattice of hanging geometric chimes. When participants lie or press on the blanket, lights and servo motors hidden among the chimes activate, causing them to swirl and tinkle. When more people lie on the blanket the pattern of lights and motion becomes more intricate in turn. We succeeded in fabricating all the necessary technology, creating the code, assembling it, and proving the concept. However, the result did not live up to our vision. The team believes that the idea is strong and the tech is viable, and we will return to this project in order to develop it to a point where it meets our expectations. Cloudy and Tangled Thoughts started with a feeling. The team wanted to create a screenless installation that evoked a feeling of peace and wonder. We wanted to use technology to bring people together with a magical experience, using technology in a way that was unfamiliar to the average user. 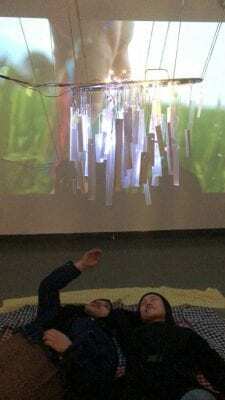 We envisioned the experience of lying on a blanket watching the clouds make shapes. It was important to us that we not create something simple like an on-off switch, a mechanism most people understand intrinsically, but instead create a relationship between sensors and output that generated a sense of wonder. The prompt for the project from the Creation & Computation class was Refine & Combine. We were to return to a previous project and expand on it. While the concept we came up with was not directly related to a previous project any of us had done, we felt confident that our previous work with code, servos, lights, sensors, and fabrication put us at the same place developmentally as we would be if this had been a prior project. 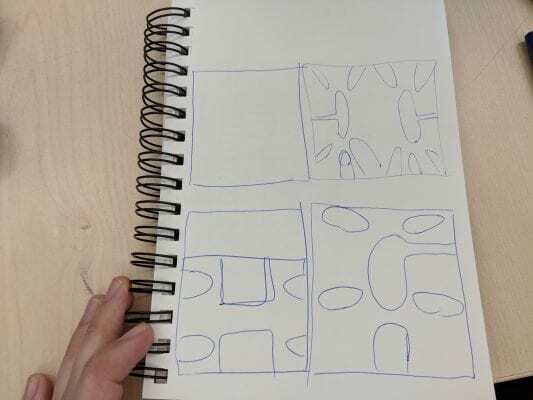 The process began with a discussion of the kind of work we wanted to create, along with the kind of skills, technology, and existing projects we wanted to carry forward. 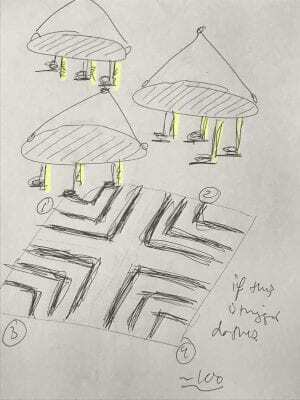 When we settled on the concept above we began to brainstorm ways to realize it. 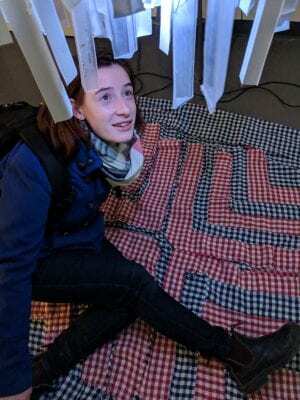 We knew from the beginning that we wanted to work with a blanket and conductive fabric, but we debated over what form the apparatus hanging above, which needed to interact with the conductive fabric, would take. 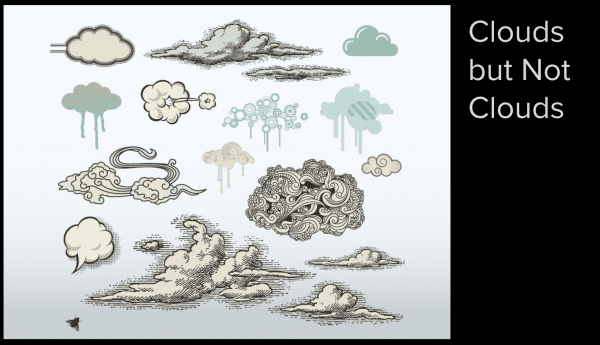 Since we had begun by imagining looking up at clouds, we researched installations and works of art utilizing cloud imagery and looked for inspiration there. We decided that a series of geometric shape would complement the organic flowing nature of the blanket below. We envisioned multi coloured plexiglass, laser-cut into geometric shapes, hanging like wind chimes, diffusing light from above as they drifted and tinkled. We submitted a proposal and consulted with our professors, Kate Hartman and Nick Puckett, for their opinions on how best to proceed. Kate provisioned us with 16sqft of conductive fabric, velostat, and a sewing machine for us to experiment with. 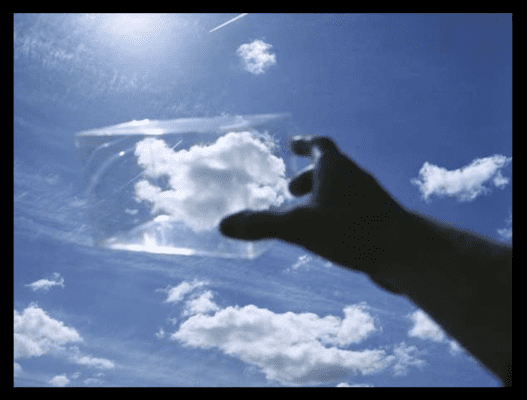 Nick suggested that, rather than use the heavy and difficult to cut plexiglass, that we look into vellum as our cloud material, as it was light and would keep its shape after being folded. Experimentation with vellum gave us a lot of data. We liked the way light moved through it and its versatility, and after trying several forms we settled on a triangular prism shape for our cloud-chime objects. However, we did not like the look of the vellum and wanted to find something more uniform and robust. We settled on a thin plastic and consulted with John Diessel in the Plastics Lab. John suggested that, since we planned to manufacture many identical objects from lightweight plastic, vacuum form was the best process for us. We built a form out of wood with the help of Reza Safaei in the Maker Lab and returned to the Plastics Lab to begin making what we affectionately came to refer to as “the boys”, all of which is discussed in detail below. 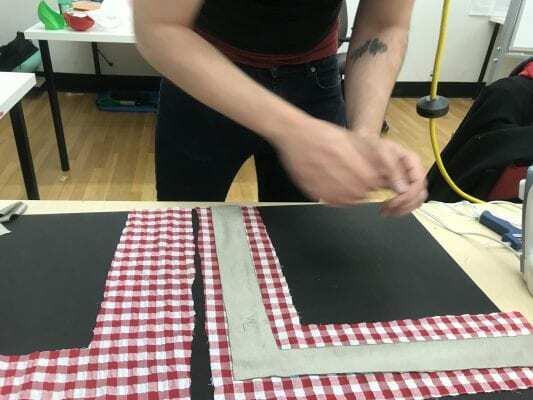 Our conductive quilt was designed to control and move elements using servos. At first we went for simple geometrical shapes and simple constructions. 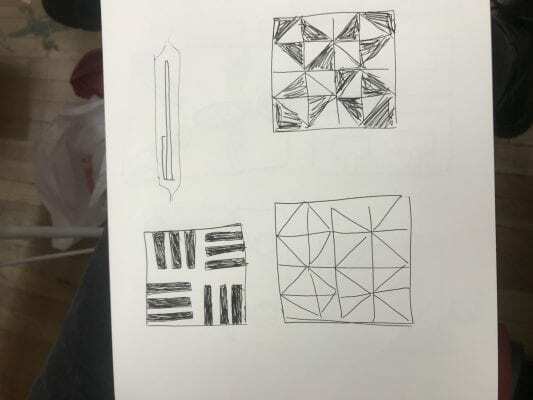 We had started out with wanting to control 12 unique shapes as we had built 12 sensors on to our quilt. 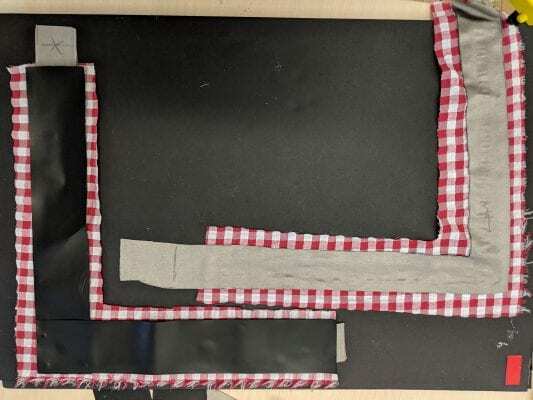 We became very focused on the quilt, to the point that we had used up much of our allotted time before turning our attention to the servos and hanging apparatus.. Nick Puckett our professor has suggested using vellum, a material which which is easy to control due to its lightweight. The problem we encountered with vellum was that whenever we folded it to take the shape we wanted it to, it would become brittle and break at the folds. We were also slightly getting frustrated with how to to control each shape with the servos and how to mount the servos on the ceiling. We considered but decided against laser cut a mount which would hold the servos together, as we felt it was too late in the process to begin something we were unfamiliar with. At this point we as a team were getting unsure of using the servos to control the shapes. Our team mate Olivia suggested buying some fans and a relay, so that the quilt would start a fan based on where the participants sat. The fan would then start to blow these shapes. We did a rapid prototype using the vellum to construct simple modular shapes and hung them up to see the effects. We all agreed that the effects that the simple shapes created with the lights would look great. We decided we liked the shapes and the effect it had. We were still unsure about using the fans when we looked further into buying a relay which was expensive and we were not very sure if we had to write new code for the fans. In addition, the relays came with a large constraint: only one attached object per relay could be powered at a time. This, combined with the cost of the relays, led us to shelve the idea of using fans. We made a trip to the plastics lab at 100 McCaul to consult them on our simple modular shapes. John Diessel suggested we use light weight acrylics and the vacuum molding machine. They suggested we fabricate a molding shape that could be used with the machine. The largest size the machine could handle was 12×12 inches. We went back to 205 and visited Reza at the makers lab on the 7th floor. He understood exactly what we were looking for and helped us construct a shape using our vellum prototype. We took the shape and went back to the plastics lab. We were instructed on how to use the machine to vacuum mold our shapes. Each sheet gave us 8 shapes, which meant we could produce a lot of shapes fast. 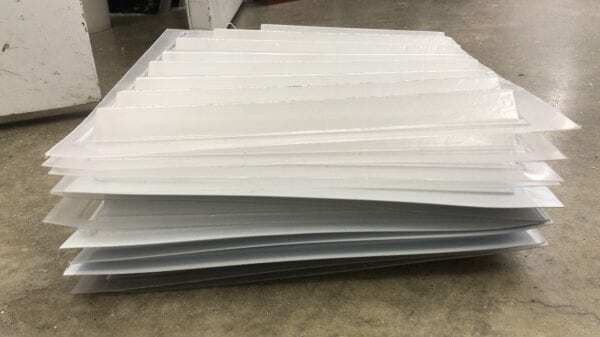 We bought ten 12×12 sheets, 5 in translucent colour and 5 in white. It took roughly about 5 hours to construct and cut the shapes. Due to the makers lab and the plastics lab both being closed at night, which meant we had to cut the shapes by hand using scissors. This took a long time and was physically taxing on the team. 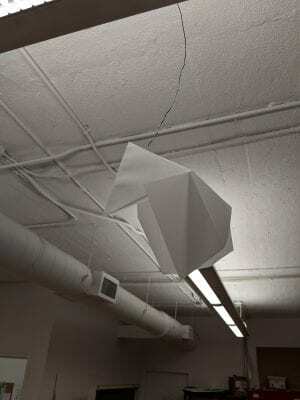 After we had completed molding our plastic shapes, we as a team were still unsure of how to have these shapes hang on the ceiling of the experimental media lab grid. We decided to use aircraft cable to hang the apparatus and even clip the shapes to hang using aircraft cable. We made a trip to Canadian Tire in the morning to buy crimpers for the aircraft cables. Unable to find the right grid to hang up, we made an exploratory supply run and came across a barbecue grill. Excited by the image of three circular mounts hanging in a staggered manner, we decided to buy three barbecue grills. At this point when we bought the barbecue grills, we only had 80 hanging shapes, which cut in half gave us about 160. 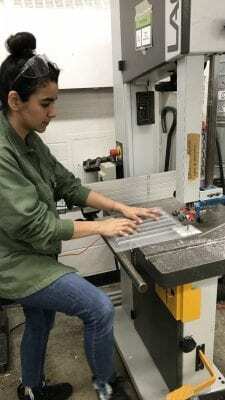 We soon realized that unfortunately that wouldn’t be enough for three grills, which meant we had to make a quick run again to the plastics lab. This is where we should have as a team scaled down rather than scale up. Building the hanging apparatus consumed a lot of time and energy. We know now in retrospect that it would have been better to go with large simple shapes rather than having so many small shapes. The small shapes made sense in the moment and looked good when hung, however they took a long time to construct. Meanwhile we had also been fabricating the blanket. 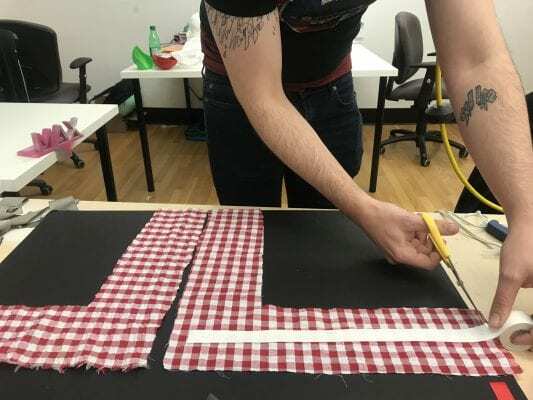 We used documentation from “Intro to Textile Game Controllers Workshop” run by Kate Hartman to fabricate analog sensors from the conductive fabric she gave us. 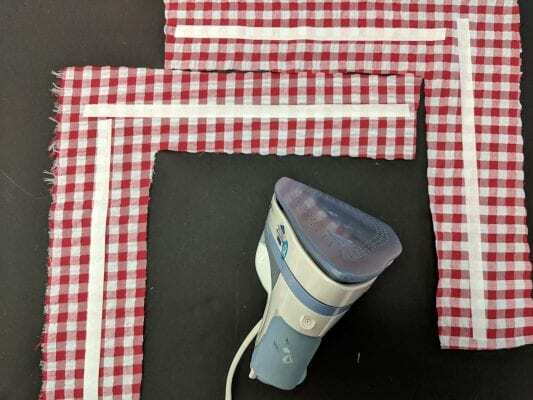 We built several small sensors to test, including one we sewed into a “sandwich” with regular fabric above and below in order to approximate the effect of the sensor when sewed into the blanket. The test sensors worked well, and we felt we were ready to scale up and begin fabricating full-size sensors. 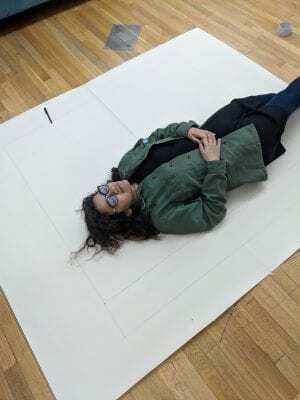 We laid out a large sheet of paper in order to mark and measure out the approximate size of the blanket. We decided a size of 4 feet by 4 feet was ideal, as it was large enough for two to lie comfortably while not being too large to manage. 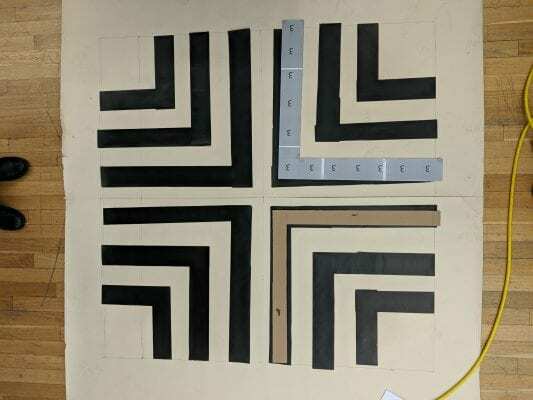 We debated for some time on the best way to layout and orient the sensors, with pitches ranging from as few as four sensors arranged in quadrants to dozens arranged in small triangles. We settled on the final version, pictured below. It allowed us to have either ends’ point of contact be on the edge of the blanket, meaning we would not need to run wiring through the blanket proper. It was, we felt, a manageable number of sensors, but enough to give us a lot of options for interactions in the final code. We also felt it was aesthetically pleasing, and thus an excellent blend of form and function. 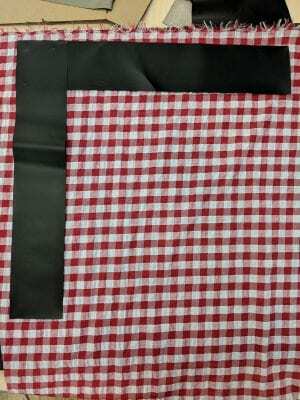 We selected classic “picnic” fabric in red, blue, yellow, and white gingham to give the device the affordance of a homemade picnic blanket. 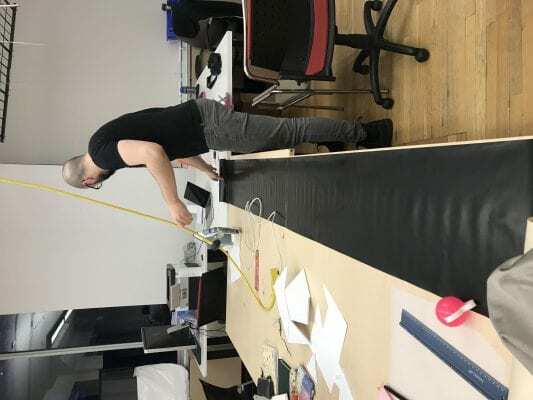 We plotted the sensor placement at 3-inch intervals, allowing 3 inches of velostat width per sensor, with conductive fabric cut slightly thinner than the velostat. 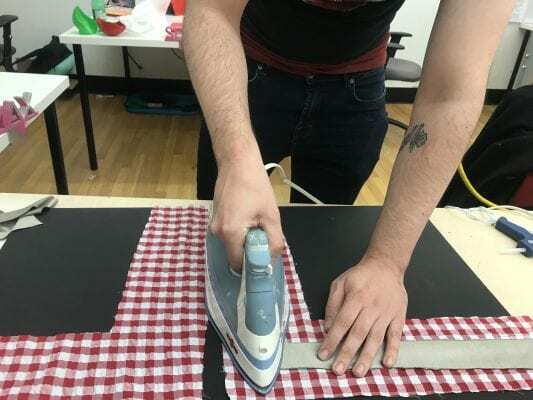 We ironed the conductive fabric to strips of red-checked cloth, attached the velostat with dabs of hot glue, and folded the two sides together. They were kept in place with a few more dabs of hot glue until they could be sewn together permanently. We took pains to avoid puncturing the conductive fabric, sewing along the outside of the velostat. 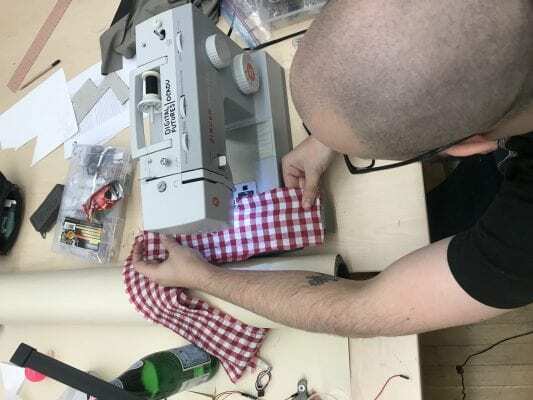 We left the ends of the conductive fabric trailing out of pockets at either end of the sensor to allow for easy connection later. 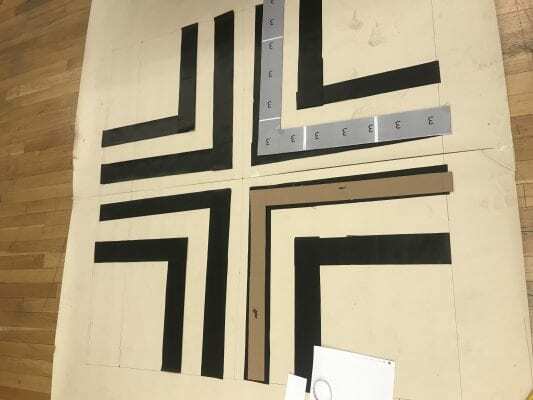 Measuring out pattern for cutting fabric and Velostat. Below: the process for making the sensors. 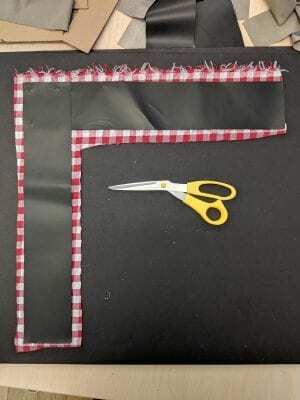 After attaching two 3inch-wide lengths of velostat, block out a length of cloth slightly wider. Cut out a second length, the same size as the first. 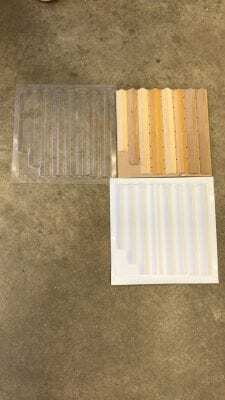 Place and iron lengths of iron-on adhesive. 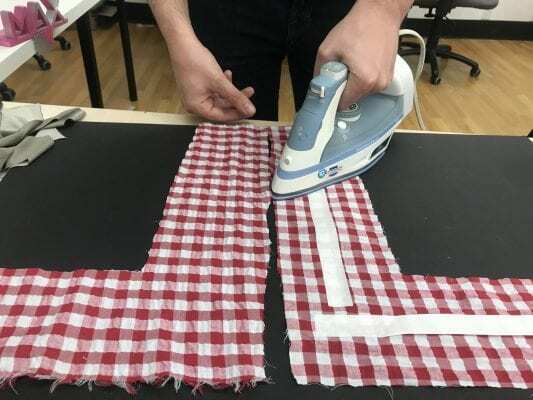 Iron the conductive fabric to the iron-on adhesive. 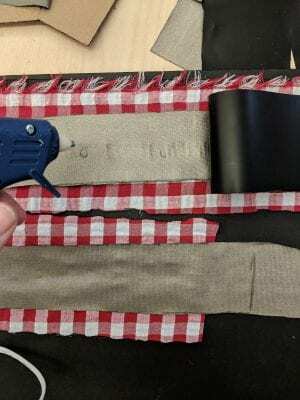 Lay the velostat over the conductive fabric. Use small dabs of hot glue to keep the velostat secure on both sides. 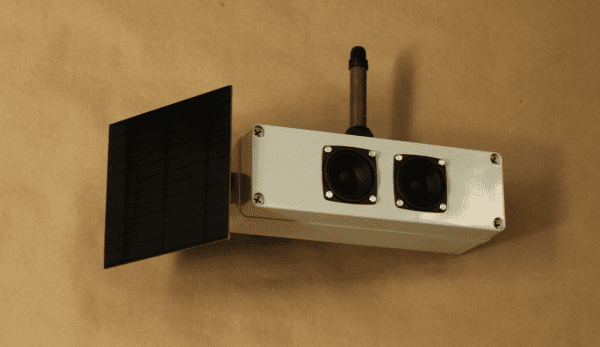 As we completed each sensor, we tested it to ensure it was viable. 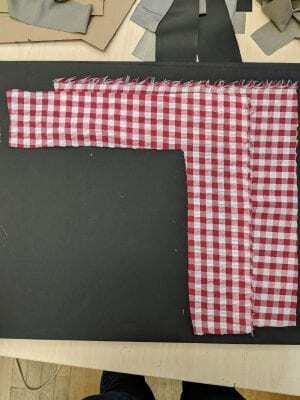 When all the sensors were sewed and tested we cut a swatch of blue checked cloth at 4.5×4.5 feet to be the base of the blanket. We measured out and placed our sensors where we wanted them to be, then pinned them in place. 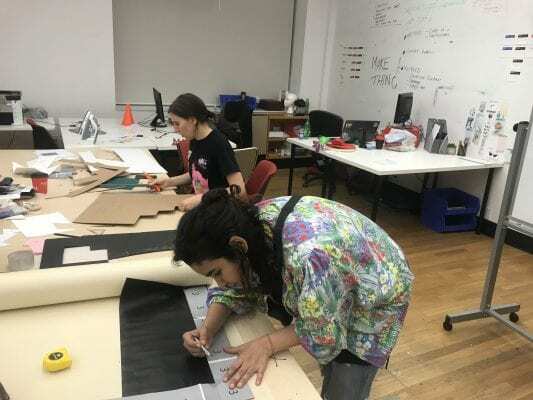 We conceived of and experimented with a power bus of conductive fabric along two sides of the blanket, to reduce the amount of wiring we would have to attach. We liked this idea as it made use of the blanket’s form to inform the function of the installation. However, we discovered that this layout diminished the effective voltage too much to get effective sensor readings, and we shelved the idea of the power bus. In retrospect, this should have been a warning sign to us that the power we were supplying was insufficient for our purposes. One by one we sewed a hem in between the sensors. This fixed them in place on the blanket base, covered up the ratty ends of the sensors, and had the added benefit of making the blanket look softer and inviting to sit down on. 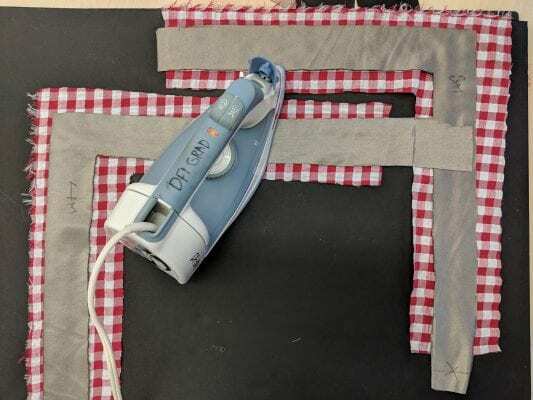 We intended to tuck the extra fabric at the outside of the blanket over making a hem and channel for wiring while keeping the blanket looking nice and minimizing obvious electrical attachment points. Unfortunately, our trusty sewing machine hit a snag late in production (the housing for the lower bobbin was pushed out of alignment, jamming the machine). While apparently not an uncommon problem, online diagnostics recommended taking the machine in for service rather than attempting to fix as a layperson. Without enough time to get the machine fixed or exchanged before the deadline, this was as far as we would get with our blanket. Luckily all the sensors were secured by this time and subsequent stitching would have been aesthetic. Our main concern when deciding was how to code the blanket to create an interesting relationship between the laid out sensors and the servo motors above. We were curious with how the user would explore the interaction between the two separate components. We contemplated having a one to one relationship (i.e. 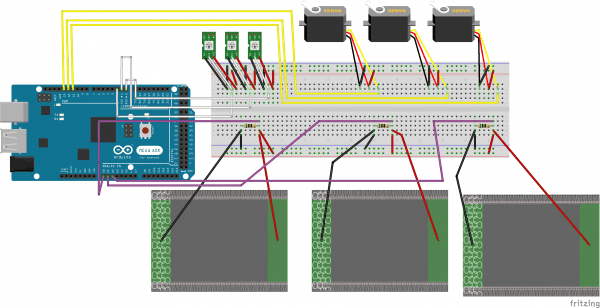 one servo motor to every sensor). We as well considered having a rippling effect amongst the servo motors – when one servo would be activated a chain of the surrounding servo motors would also move. As well, something that was overall important to us was that the clouds above reflected the participant’s position beneath the hanging apparatus. We thought this was interesting because it became a piece about the reflection of interaction. The design of our quilt provided us with the given aesthetic of “quadrants”. We decided that we could determine the user’s position based off of the sum of the values from each quadrant. From there we mapped out all of our inputs and outputs that needed to have a relationship. Before we scaled up, we wanted to test the textile analog sensors acting as an input to control the output for a servo motor and led light strips. We determined what the threshold of both sensors was when some pressure was placed upon them and then used that data to determine when the motors and led lights should be activated. This was a great initial proof of concept, and we decided to proceed forward with this base code. Another thing that became apparent was that the hanging apparatus, due to its circular shape was hard to mount and hang in a balanced manner. We had run out of aircraft cable – which had actually proved to be extremely difficult to work with – so we decided to use twine to get the shape mounted. Another difficulty we ran into was the wiring of the apparatus to the floor. We were not prepared with the right set of wires which would be long enough to reach our breadboard. We attempted to use long individual wires, but that was impractical. Kate and Nick lent us long modular wiring, which significantly helped us with the hanging process. Also we learned that Kate is master at knots. Her wizardry helped us hang the apparatus quickly and safely. We had lofty expectations for this project which the completed version did not meet. 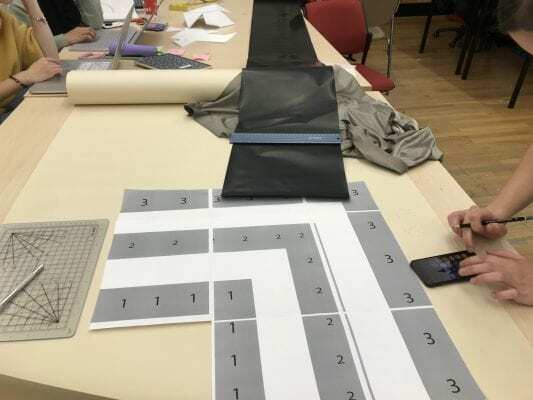 No aspect of the build was lax – we felt, in the end, that there had not been enough time in the two weeks we were allotted for the team to build, test, and iterate on the design enough to reach the state of completion we had envisioned. 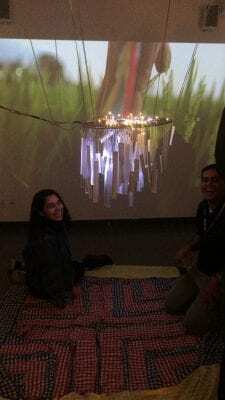 In the end, we did have an interactive experience where the quilt activated led lights and gentle servos above. We also incorporated a projection behind to elevate the sense of being out in nature. This project taught us many things about working with unfamiliar materials and pursuing lofty goals in a short time frame. Some core reflections we have taken away are below. Our sensors only worked consistently when the ground and the positive were clipped to the opposite ends of the fabric. We experimented with having the two ends of the circuit clipped close together, which – while somewhat effective – was unreliable for our purpose. When all of the twelve sensors were divided and clipped together to make three “super” sensors, we had to lower the resistors significantly to get any viable reading to use with our code. Physically small sensors gave more reliable readings than large sensors at the same voltage. 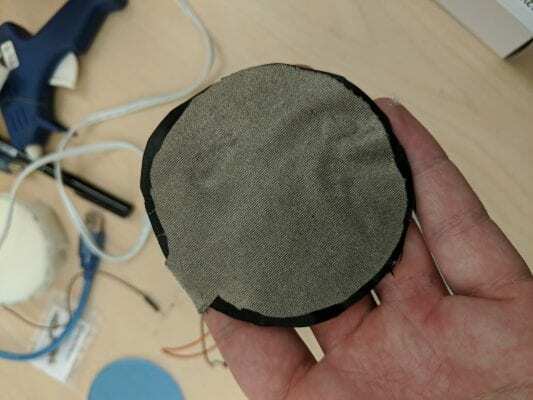 It is possible to use conductive fabric as a “power bus” to power multiple sensors – though at our scale, this diminished the voltage to an amount where they were not usable for our purpose. A special thank you to Nick Puckett whose advice on fabrication was invaluable, and who went out of his way to help the project get set up in time for its show. A special thank you Kate Hartman for her donation of material and tools, for going out of her way to help the project get set up in time for its show, and whose infectious enthusiasm kept us going. 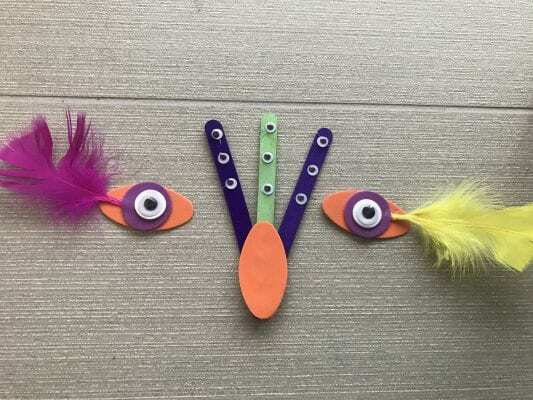 “Bird” a toy to help understand machine/animal interaction. I started out with the project wanting to work with sound. My first two projects were based around the idea of sound and using code and electronics to control and manipulate sound. 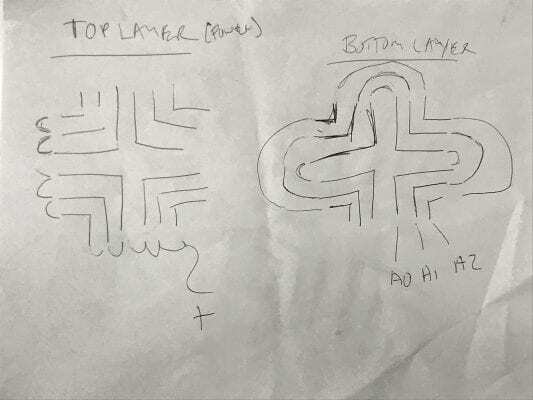 I started out by looking at my code for experiment 1 where I had sketched out a circle which moved to music using the help of the Daniel Shiffman’s coding train videos. As somebody who is new to coding, the one thing I was sure of was the the idea of using code to create audiovisual and sound experiments. My first round of brainstorming and ideation looked at building upon that concept further. Through the week after being introduced to various other examples in class and trying out a few of them I wanted to explore the idea of “connection” between humans and their machines by using a virtual pet with a physical companion to the virtual pet, almost like the 90’s toys like the Tamagotchi. 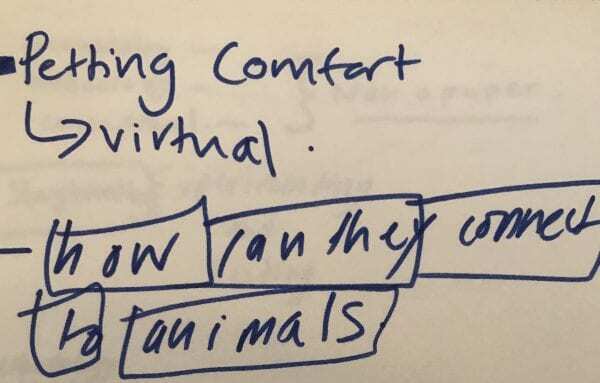 This idea of connecting with a virtual pet slowly evolved into not having the human in the mix at all. As technology and tech products get smarter to recognize more of our natural environment could technology connect to this environment just as humans can?could technology come to care for other sentient beings and look after them the way humans have? These were some of the larger questions that I had at the back of my mind during this project. 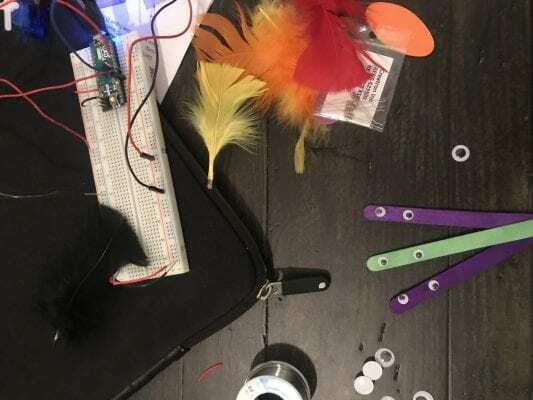 “Bird” is a toy operated by a proximity sensor which senses animals bodies and uses this to set off a toy to keep help the human connect with their pet while being physically away from their homes. With the rise of “vertical” living and urbanization, most people live in small spaces with their animal friends and companions. Unlike dogs, who need to be taken on constant walks, cat’s usually stay indoors, which sometimes causes them to be lazy and inactive. 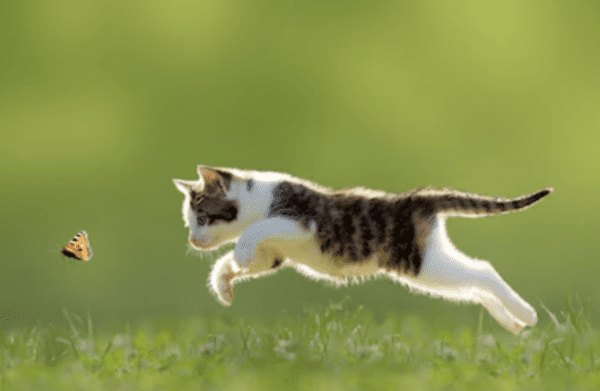 There are a myriad of cat toys and products aimed at keeping indoor cats active and healthy, however most of these toys require that humans be present in playing with their companions. For the final circuit board I used a proximity sensor and a servo connected to the Arduino Micro. I tried out a few examples on the class GitHub provided by Kate and Nick. 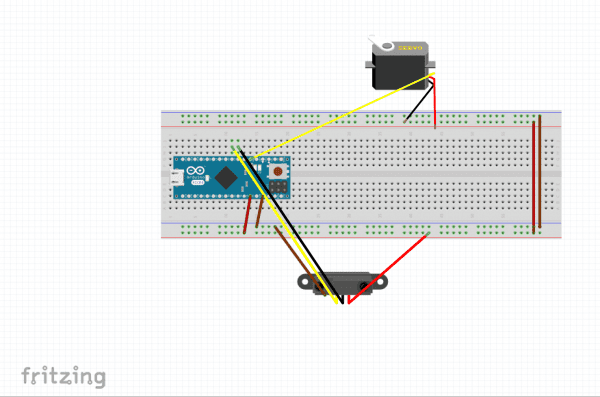 One of the examples used two potentiometers and the other another example which increased the brightness of the LED. I tried to play around with the idea of using those two examples to combine into one audiovisual experiment. As I don’t have a very strong background in code, throughout this course I’ve used the examples provided in class as a basis to built upon. During the weekend a week before the project was due, not completely satisfied with the idea I went back to the drawing board. Growing up I always had animal companions, currently I have 5 beautiful cats who live in sri lanka my hometown. As a masters student who is away from them all the time it is hard to commit to taking care of a pet, this sparked the idea of using technology to comfort that part of me that wished to have a animal companion. I came up with the idea of some sort of virtual pet, which could comfort and respond just like an actual pet. I quickly drew a sketch out with an initial concept and idea. 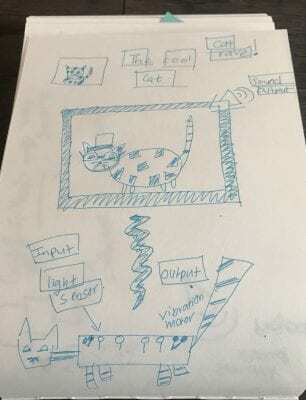 The idea was to use light sensors as input to connect to a cat sketch on P5. js . 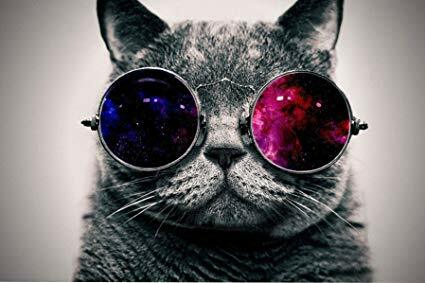 The light sensors would be connected to a physical piece of hardware maybe in the shape of a cat which when touched or pet, would produce a sound and initialize the vibration motors to start. 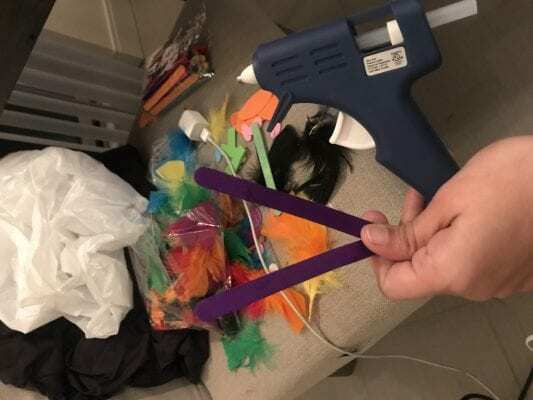 I also connected with the idea of some sort of idea a “cat rave” just to give it an element of fun and silliness. The idea of technology being silly and fun appeals to me a lot. The idea of the “cat rave” was partly inspired by this video whose soundtrack I actually used in my final project. I got working on the light sensors and was having difficulties working with two sensor values from the light sensor. Even during Experiment 2, I realized I did not particularly enjoy working with the light sensor. 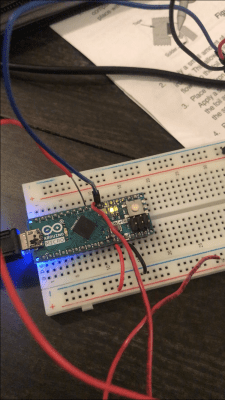 Trying to get the Arduino serial monitor to read two values was not working out for me. 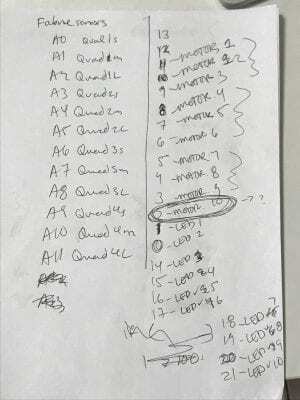 On Monday before the project was due I approached Kate in class and she gave me a few pointers such as using a serial.Print(“,” ) line to separate the two readings I was getting from the light sensors. I gave it one more try and decided to abandon the light sensor and go back to my favourite sensor, the proximity sensor. I felt that Experiment 2 had prepared me well to work with the sensor. This is the point in my project I had to go back to the drawing board. I realized that if I used the proximity sensor, I couldn’t use the vibration motors and the first idea did not make sense. This is where I took the idea of the human completely out from the idea. What if it was a an idea which purely worked with the technology and the animal. 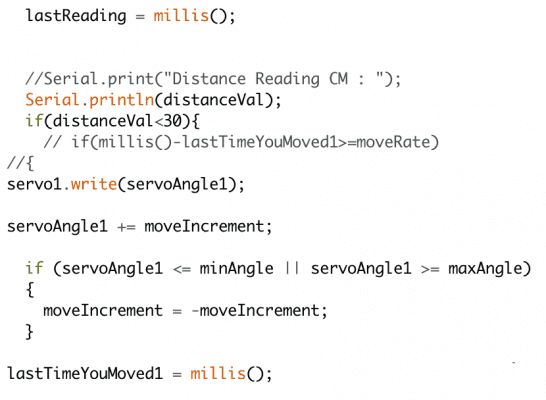 I used the examples from the class github for the proximity sensor and decided to add the servo as a part of something which moves. My thought process at this time was use the servo as some sort of toy. This is when I zeroed in on the idea that this creation or idea would specifically geared towards cats. the idea was linked to the idea of having a toy which mimics prey. I used 200 cm as max distance for the proximity sensor and 30 cm to initialize and start the servo. By the time I got the proximity sensor and servo connected it was Wednesday morning and I had two days till the project was due. 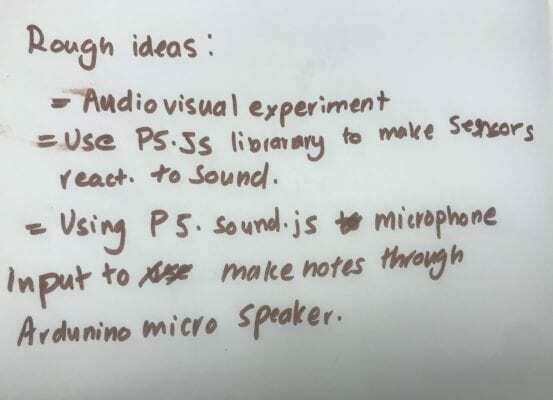 My idea for my P5.js part of the project till this point was to do a simple sketch of a cat which would make the sound “meow”. I tried to sketch out the shape of a cat using an ellipse and two triangles. Due to time running out I quickly skipped this step and tried to map out and recall an image which which was mapped to the sensor value. 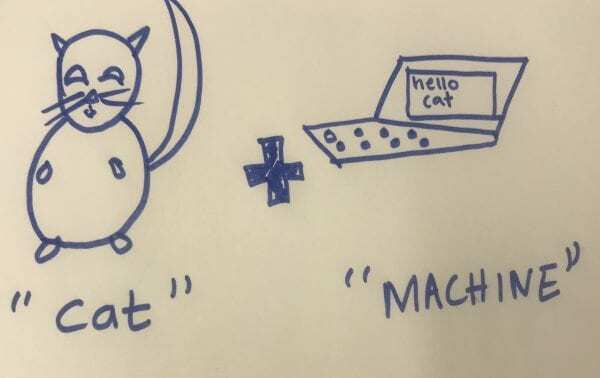 I used the image below to tie it to the proximity sensor value so that it would only be activated only when the cat is close to the machine. This action of the cat approaching starts a dual action of the image appearing and servo starting. I used craft feathers and popsicle sticks to construct a movable object that would appeal to cats. A project I found inspiring was a project I had presented for case study 2. “the kurt box” which was aimed at using electronics to interact with non-humans. “kurt box” uses a microphone to sense an animal approaching and when the animal nears the object the kurt box would plays a Nirvana song. This idea of using electronics as way of extending this human/machine connection to non-human and other sentient beings is vastly appealing to me as a designer. I usually aim to practice human-centered design coming from that background, but recently I’ve been curious especially after learning more about electronics to use these devices to learn in the aid of understanding our surroundings and nature.